São Paulo’s restaurant scene is booming. Here’s where to eat now. From doce de leite pancakes to multicourse tasting menus, São Paulo's food scene is sophisticated, experimental, and locally-sourced. Here’s how to get the most out of it. All the qualities that make São Paulo Brazil’s art hub pop — its sophistication, experimentation, and international and local mix — can be applied to its food scene. Take Futuro Refeitório (Cafeteria of the Future), an ambitious new restaurant with an open kitchen and neon signage inside a former parking garage. Depending on when you go, the place functions as a bakery, coffee roaster, fish smoker, restaurant, or cocktail bar — but Refeitório easily wins the title for best brunch scene in São Paulo. On Sunday mornings, locals will wait in line for an hour to get an order of airy doce de leite pancakes, house-made Nutella, and cinnamon-y “cruffins” fresh out of the oven. If it had opened a few years ago, Refeitório would have flopped. As recently as the early 2000s, São Paulo’s food scene was dominated by heavy, indulgent, European-style menus that focused on caviar, foie gras and lobster. “There was plenty of pasta and risotto made with [the wrong kind of] rice, and the public praised it highly,” said Rodrigo Caetano, editor of Gastronomix, a Brazilian food and drink directory. While post-recession globalization brought a sophistication to palates, the recent economic instability has had just as profound an effect on the local food scene. It’s caused the city’s chefs to get creative and turn to the delicacies in their own backyard. “Brazilian people are proud of their own culture because they can access ingredients you can only get here,” said Alex Atala, whose restaurant, D.O.M., blazed the trail for haute Brazilian cuisine. Since 2014 he’s been democratizing that philosophy at the city’s 40-year-old Mercado Municipal de Pinheiros, which he overhauled to feature obscure Amazonian and Brazilian ingredients such as jumbo vanilla pods, pequi nuts and cashew vinegar. Add a patchwork of vibrant immigrant communities — primarily Arabic, Japanese, and Lebanese — and a staggering uptick in culinary schools, and São Paulo is at the beating heart of Brazil’s food revolution. Here’s where to make your reservations. Inside the Instituto Moreira Salles, a glass-enclosed cultural center on Avenida Paulista, you’ll find a culinary oasis that focuses on lightened Brazilian classics. The star of the show is Chef Rodrigo Oliveira’s vegan moqueca. Traditionally a fish stew simmered in a zesty, dende oil-spiked broth, this meatless version relies on hearts of palm, banana, and dehydrated cashew fruit for its heartiness and flavor. Order it for the table, along with flaky, deep-fried pastéis stuffed with mustard greens and canastra cheese. It took co-owners (and sisters) Karina and Gabriela Barretto two years to secure the lease for this unconventional, charmingly industrial bakery that turned a neglected parking garage into a stylish mess hall. Go for the first meal of the day. Karina suggests cobbling together a multicourse affair, first with pastries and walnut-laden banana bread, followed by breakfast sandwiches made with home-baked sesame buns, mild queijo minas, and perfectly gooey eggs. Don’t forget the house-roasted Meia Noite coffee. 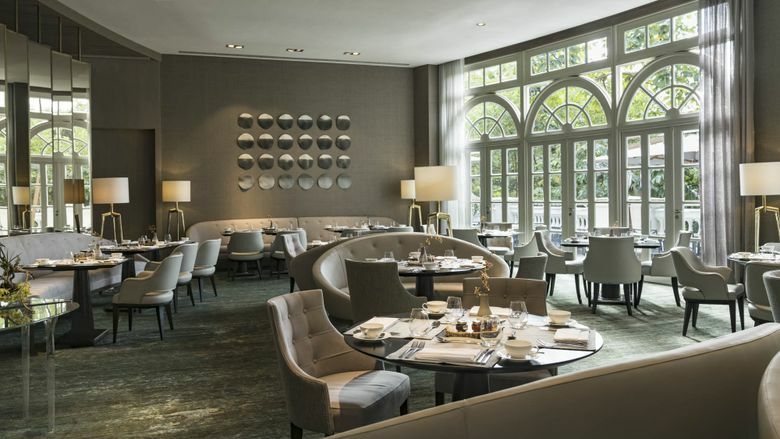 The year-old Palácio Tangará, a 141-room sister hotel to Le Bristol in Paris and the Lanesborough in London, is worth the trek to Burle Marx Park on the far southern edge of town, if only for its Michelin-starred restaurant by Jean-Georges Vongerichten. With 33 Brazilian labels in its glass-encased wine cellar and French doors overlooking an illuminated pool, the restaurant has become a sought-after date-night spot for wealthy Paulistas. Prioritize the sea scallops with passion fruit and browned butter; then have the showstopping Atlantic sea bass, sourced locally and served in a lip-smacking caramelized mushroom sauce. This bright, wood-paneled spot in Pinheiros centers heavily around the cuisine of Piauí, a little-visited state north of Bahia. The all-female staff can guide you through options such as carne de sol, a type of sun-dried meat stew made with salted and cured cuts, or baião de dois, which stacks creamy, roasted pumpkin flesh and white cheese atop rice and black beans. Sundowners on the terrace are a must — as is dessert. The treacly coconut flan is just one of the reasons this place was listed among the best restaurants of 2017 by a variety of local newspapers and magazines. Going on a gastronomical tour of São Paulo and not splurging on the 14-course tasting menu at D.O.M. is like going to Rome without eating pizza. Atala is famous for creative use of hard-to-find Amazonian ingredients, such as Yanomami mushrooms and gargantuan hearts of palm, which he cuts into strands of fettuccine dressed with dried shrimp furikake. Although it’s less talked about, his use of Brazilian seafood is equally a standout. Take D.O.M.’s Santa Catarina oysters on the half shell: They’re fried, tossed with translucent tapioca pearls, and plated inside a delicate piece of porcelain. “Getting people to come out of their comfort zone … [is my] main goal at D.O.M.,” the chef told Bloomberg. On that level, and many others, he delivers. From the moment you walk through the tropical pink hallway to the main dining room, it’s clear that Maní is a special, if eccentric, place. Here, Helena Rizzo offers a three-course tasting menu that, at 210 reals ($52), is one of the best deals in town. The bread alone, smeared with peppercorn-studded goat cheese and smoked paprika yogurt, is worth the arduous reservation process. (Have your concierge snag a table, or plan to book four weeks ahead.) Follow it up with the Maní Egg, a slow-simmered single yolk framed in white pupunha foam, or the tortelli, which are stuffed with a creamsicle-like pairing of Brazilian tulha cheese and sweet melon. This rustic, 44-year-old family-run eatery in far out Vila Medeiros shot to fame when second-generation chef Rodrigo Oliveira revamped the entire menu in 2006. The dish that catapulted him to fame? Dadinhos de tapioca, an addictive tapioca fritter — golden crispy on the outside, succulent in the middle — that gets dipped into a tangy sauce made with garlic, Cachaça, and mango vinegar. On weekends, the cafe draws more than 1,000 customers a day. To skip the line, head to the second floor of the Mercado Municipal de Pinheiros and the lush outdoor terrace, where offshoot Mocotó Café serves the same dish with a Bamberg Mocotó beer.